Justin's grandpa's neighbor put up this one on a shed. 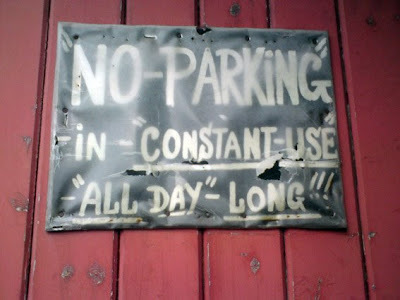 My guess: you could park there between the hours of 3 and 4 am and nobody would be the wiser. I now have a large headache from trying to keep track of what that sign is actually saying. I think this sign is telling us that we can actually park here, because, after all, sombody is just pretending it's in constant use all day.